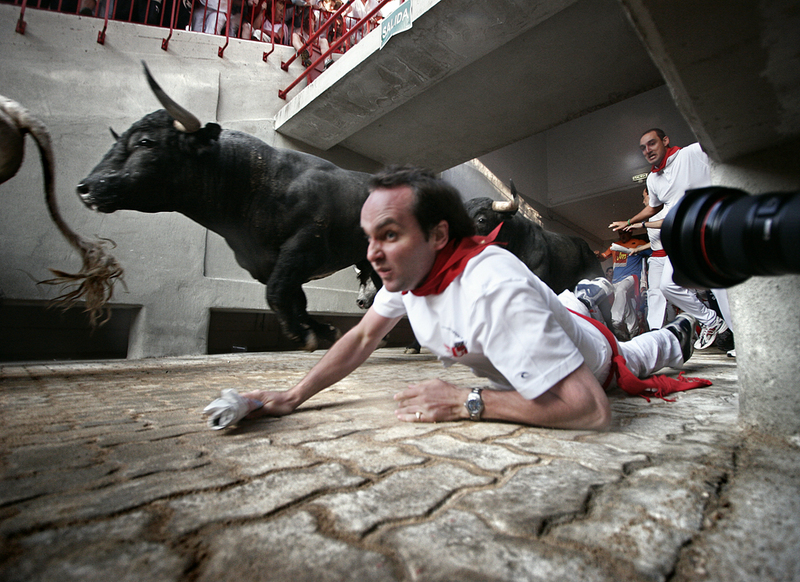 Although it may not appear so, no two Encierros or bull running events are the same, or even similar. Having said this, some of the Pamplona Encierros do in fact stand out from what could be called the "standard" Encierro. This is because they have beaten the record with regard to the number of people gored by bulls: on 12th July 2004, and also on 12th July 2007, the bulls from the herds of Jandilla and Marqués de Domecq respectively, gored no less than eight runners. On the other hand, Sunday the 9th July 1994, with the Miura bulls running, was the day on which the largest number of runners were attended in the street by the Red Cross; no less than 107, although all for minor injuries. On the contrary, on the 19th September 1992 - when the San Fermin Chiquitos (small festivals) were in full swing - the lowest number of minor injuries attended in the street was recorded - just 3 people. Mention should also be made of the Encierro run by the Miura in 1959, given the fact that it was the longest in the documented history of the Encierro, lasting no less than half an hour. This situation was created by one of the bulls refusing to go into the pen, and being finally made to do so by a small sheepdog who was later applauded by the public in the bullring. To go to the other extreme, the fastest bull ever to run the route in Pamplona was the 600 kilo "Huraño", pertaining to the Jandilla herd and who, on 11th July 1997, ran way ahead of the rest of the herd to cover the 850 metre route in just 1 minute 45 seconds. The Encierros of 13th July 1980 and 10th July 1947 deserve a separate mention, being the only two bull running events in which two deaths have occurred on the same day and by the same bull. In the first event, the bull named "Antioquio" from the Guardiola herd killed a runner in the Town Hall Square and another in the bull ring. In the second case, the bull called “Semillero”, from the Murube herd killed a runner in the Estafeta street and then another in the bullring. Some Encierros are remembered for being curious and anecdotal. Here we would cite the one on 8th July 1995, when a Miura bull left the bullring and ran 100 metres back along the street. Also, on 12th July 1988, a bull from the Cegada Gago herd turned back and ran right down the Santo Doming slope to the bull pen door. There have been extraordinary bull runs for many reasons: when the same bull gored father and son in less than 20 metres (2003); when a pile-up of runners occurred and completely blocked off the street in such a strange place as the street of Estafeta (1993); or when a bull broke through the fence at Telefonica and escaped after goring a spectator (1940). There have also been cases of bulls escaping and falling into the river during the short evening bull run when they are driven to the pens in Santo Domingo for the start of the bull run on the following day (1915, 1922 and 1957) and, even stranger still, between 1904 and 1932 on eight occasions it was necessary to perform two Encierros - a second run half an hour after the normal Encierro due to the fact that one of the bulls refused to leave the Santo Domingo pen with his brothers at the traditional time.